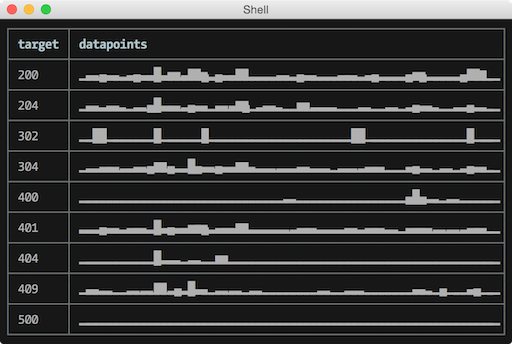 A tool for processing data with functional pipelines. In the command-line or interactively in browser. Or, pass in --interactive to launch in browser. The idea is to compose functions into a pipeline of operations that when applied to given data, produces the desired output. By default, the function is applied to a stream of JSON data read from stdin, and the output data is sent to standard out as JSON. All Ramda's functions are available directly in the context. See http://ramdajs.com/docs/ for a full list and Evaluation context section for other functions. 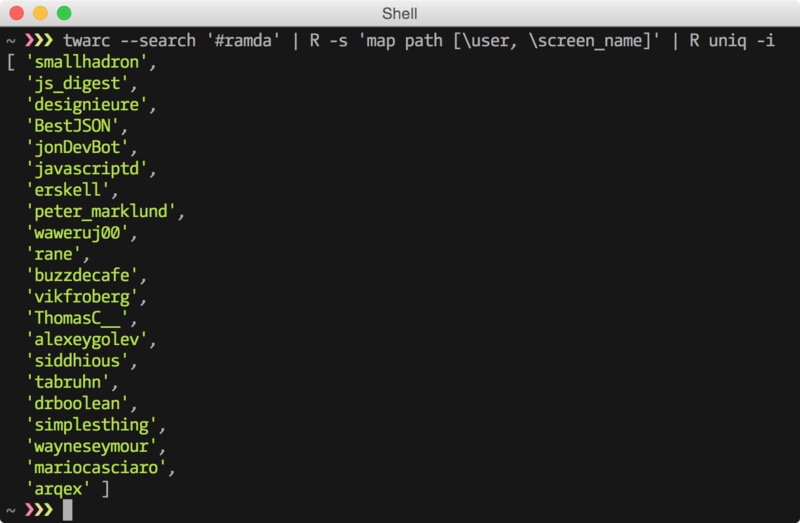 When launched with the --interactive parameter, ramda-cli opens in the browser. The pipeline, if given, is placed in an embedded code editor that emulates the prompt in command-line. As the pipeline is edited, changes to output are reflected below in the output panel. In interactive mode, ramda-cli is generally operated the same way as on the command-line. The key benefit is being able to develop pipelines incrementally with much shorter feedback cycle. Input is passed to interactive mode in stdin, as usual. You may pipe stdout to other commands even when using interactive mode. When the interactive mode tab is closed, the result will printed to stdout. Get a list of people whose first name starts with "B"
Reason for underscores (e.g. h \ul, _) is that hyperscript API is not curried (and can't be because it's variadic). We need to explicitly state that this function is waiting for one more argument. For more examples, see the Cookbook. Launch interactive mode in browser. Load a function pipeline from a file. Useful for scripts difficult to express in command-line. You can overwrite command-line arguments through the script by exporting a string in property opts. Print compact tables and JSON output without whitespace. When used with --output-type raw, no line breaks are added to output. Read all input from stdin and wrap the data in a list before operations. After the pipeline is applied to an item and if the result is an array, its items are printed separately. Transform the input stream using the pipeline as a transducer. Requires all functions in the pipeline to be able to act as transducers. This option essentially allows performing operations like R.map or R.filter on items as they come without waiting for the stream to complete or wrapping the input stream in a collection with --slurp. Parse the input stream with given JSONPath expression. Process a huge JSON array one by one without reading the whole thing first. * as JSON path unwraps the array and objects are passed to identity one by one. Parse stdin as one of these formats: raw, csv, tsv. Instead of JSON, format output as one of: pretty, raw, csv, tsv, table. With raw output type when a string value is produced, the result will be written to stdout as is without any formatting. CSV or TSV output type can be used when pipeline evaluates to an array of objects, an array of arrays or when stdin consists of a stream of bare objects. First object's keys will determine the headers. Print nearly any type of data as a table. If used with a list of objects, uses the first object's keys as headers. When using pretty-printed output, set how deep structures are verbosely printed. Useful when output is huge and you want to see the general structure of an object or list. Don't read stdin for input. Useful when starting a pipeline with a constant function. Set if input csv/tsv contains a header row. By default, csv/tsv input is assumed to contain headers. Use a custom csv delimiter. Delimiter is comma by default. Install given package from npm, and make it available in the pipeline. Symbol : combined with a name can be used to declare the variable name module should appear as. Otherwise, it is imported as camelcased name of the module. Can be used multiple times to import more than one module. Edit ramda-cli config file in $EDITOR. An alternative is to use Maybe type. The purpose of a global config file is to carry functions you might find useful to have around. The functions it exports in an object are made available. New in v5.0: ramda-cli installs specified modules transparently from npm, manual installation is no longer required. With the --import parameter, any module from npm can be installed and imported into the pipeline context. Invocations with a particular module will be instant once installed. Promise values are unwrapped at the end of pipeline. then helper function can be used to map promise values. You can turn on the debug output with -v, --verbose flag. Use -vv for even more verbose output. 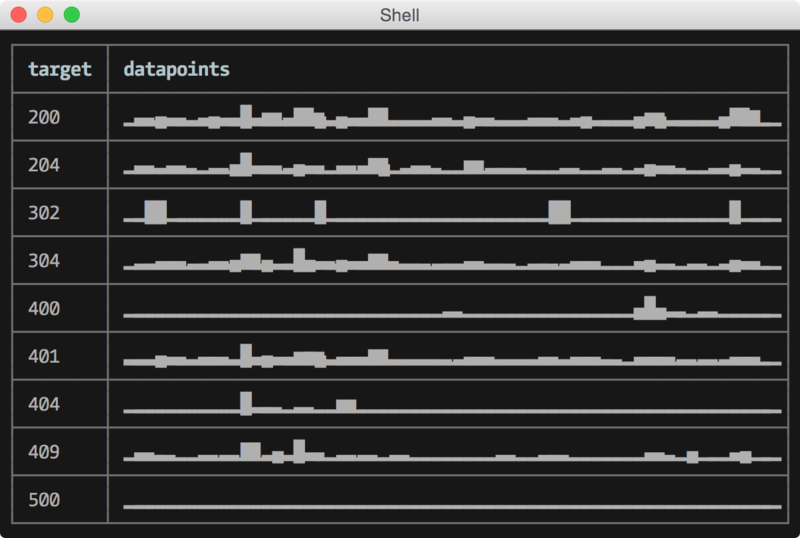 Verbose output shows what entered LiveScript compiled to. To debug individual functions in the pipeline, you can use something like treis. 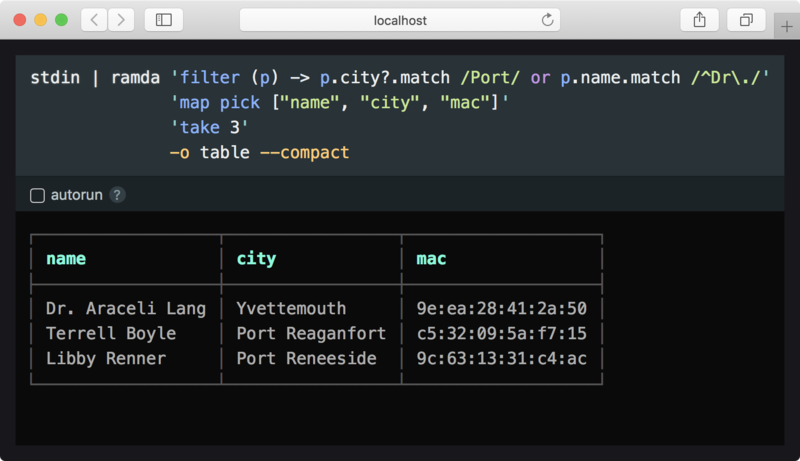 All expressions in the table evaluate to a function, and are valid in ramda-cli.